After an action packed Autumn season we're back for our first headlined event of 2017. Never dissapointing we've booked two acts we've been chasing for sometime and are delighted to announce two debutants for the Steel City. First up is the dutch duo part of the team responsible for the monsterous Dekmantel festivals, label and night series - so excited for them to bring their ridiculous record collections to the Woolworths. 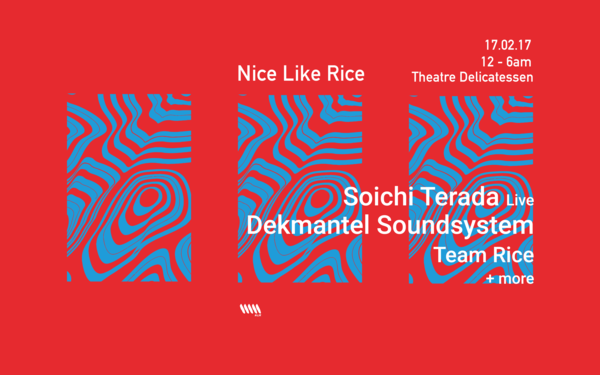 Not only that but we have Japanese long serving producer Soichi Terada flying over from the far east! We've been a fan of his productions since he did the soundtrack to Ape Escape back in 2002! Delighted to say we're bringing all of this back in arguably the most creative late night venue in Sheffield - Moor Theatre Delicatessen... Cosmic Disco are on decor duties and will be providing a few installations to ensure the party will be a treat for the eyes aswell as the ears, check out their upcoming events and page for a sneak peek. Shefffeeeeeeelll! are you ready to show us how you're gonna get down in 2017?! Last year we managed to donate £1,200 to charity by agreeing an enlarged booking fee donation agreement with the team. Big up yourselves guys! That's right! Thomas Martojo and Casper Tielrooij the dutch duo who are behind the night series, the record label and the legendary Dekmantel Festival are coming to Sheffield. The Dekmantel Soundsystem crew have firmly established themselves as kings of high quality musical enjoyment in more ways than one. Dekmantel Soundsystem, which sees Thomas and Casper dig deep into their record bags and play mesmeric back to back to back sets that are fully of seductive surprises and groovy gems, offers a tasteful and 360 degree take on electronic music that has truly helped put the Netherlands and its scene on the map in recent years. Frequently seen dressed in a Hawaiian shirt and sporting a huge, glowing grin, veteran DJ/producer Soichi Terada is one of electronic music's most charming individuals. The Tokyo-born artist is equally known for his early '90s deep house tracks and his numerous video game soundtracks, but he's also ventured into other styles such as jungle and downtempo. Terada's musical career stretches back to the late '80s, when he was a member of rock band Tax Flee, who released a self-titled album on Polydor in 1987. After graduating from the University of Electro-Communications in 1989, Terada started a label called Far East Recording in order to release his electronic music when no other labels expressed interest. Sheffield old guard Dan has been a resident at pretty much every club/ night in Sheffield worth hearing about. "One of the best scratchers in my original DJ crew", Andy H - its obvious Dan J has many hidden talents. Organisers, bookers and selectors behind the Miami Rice night series - your hosts for the evening.